Cherry Facts, an information sheet for kids cooking activities. Cherry facts and general information about cherries. 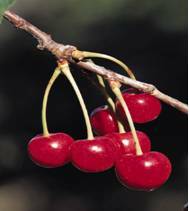 The Bing cherry or the sweet cherry is available late spring while the sour cherry is available in June-July. Cherries grow on trees like apples or plums. Buy cherries that are dark in color and plump. For sour cherries they should be a true red color. The stems should be attached and avoid any with brown spots. Store in fridge. But do not wash before storing. Wash before using. Pit Cherries with a cherry pitter, paper clip or safety pin. Eat as is, add to fruit salads, sauces or toppings. Cherries are high in antioxidants, a great source of beta carotene, Vitamin C and Vitamin E.
Prepare your favorite crepes or pancake recipe. Mix together sugar and sour cream until sugar is dissolved. Set aside. 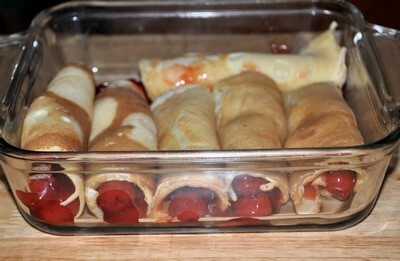 For Crepes: Set one crepe on a board, put a row of cherries across the crepe, in the lower 1/4th. Roll the crepe from the bottom over the cherries and to the top. Drizzle with sugar/sour cream mixture. 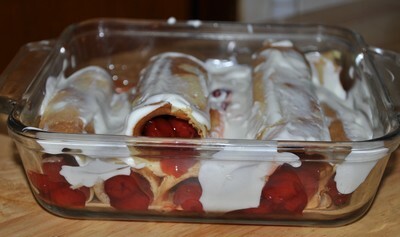 For Pancakes: Top pancakes with cherries and drizzle sour cream mixture over top. Submitted by one of our readers. It's really not coke, but its cherry mushed up or "cherry juice." Just smash up or squeeze out cherry juice from cherries! Yum, they taste delicious and drink. Some people don't like MUNCHING on them, so they can drink them. That's what I do. So instead of calling it Cherry Juice, I add the "coke" in it just to liven things up and trick people when they ask for a drink. They ask for a drink and i say, "How about some cherry coke?" I come back with cherry juice and they look at me as if I'm weird because that's not what they intended!